can be found on rocks in the Peterborough region and northern Ontario. Canoeing as a method of transportation has ancient roots in Ontario, as witnessed in petroglyphs found in the Peterborough area and on sites in northern Ontario. For millennia, the canoe was a primary mode of transportation for First Nations peoples and provided the best means for early explorers and voyageurs to travel across the rugged Canadian landscape. The canoe was ideal for the rocks and rapids of Canadian waterways. Canoes were made out of readily available and lightweight materials that could carry many times their own weight. In the 1850s, the use of canoes for racing led to design changes that increased speed. Canoe manufacturing was a primary industry in the Peterborough area in the late 19th century, with the Ontario Canoe Company, the Canadian Canoe Company, the Peterborough Canoe Company and the English Canoe Company. The Canadian Canoe Association was founded in 1900 in Brockville as the governing body of competitive canoeing. In 1936, canoeing was recognized as an Olympic sport, and Ontarian Francis Amyot (1904-62) won the gold medal in canoeing at the Summer Olympics in Berlin, Germany. Whether through elite canoeing or as part of extreme adventure racing, canoeing excellence remains at the centre of Ontario’s sporting culture. Visit The Canadian Canoe Museum website. 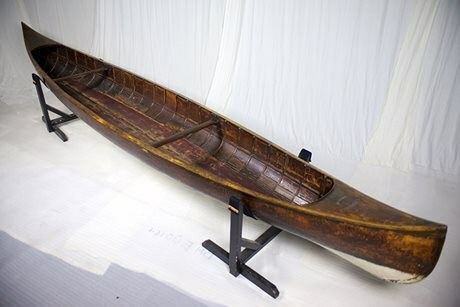 Explore the history of the canoe and other icons from the Canadian Icons website. Learn more about the Canadian Canoe Association at the Canoe Kayak Canada website.